Archaeologists in Mexico have uncovered the sub-structure of an ancient pyramid that came to light after a devastating earthquake in September. 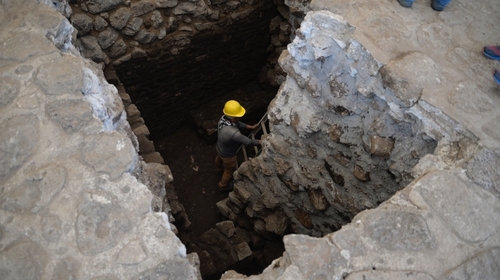 The discovery could shed new light on the Tlahuica civilisation, according to experts. The foundations of the pyramid were discovered at the Teopanzolco archaeological site in the state of Morelos during restoration work to repair earthquake damage. The city reportedly dates back to about 1200 AD but experts believe that the new discovery of the substructure indicates a much longer occupation. Teopanzolco is a popular site for visitors to the Ehecatl Temple, a building dedicated to the Aztecan deity associated with the wind. The substructure of the older pyramid reportedly lies below this temple. The Tlahuica were one of the ethnic groups of the Aztec civlisation who had migrated to current-day Morelos state during a period of great expansion from Tenochtitlan, current-day Mexico City. A 7.1 magnitude earthquake hit central Mexico, killing 369 people, on 19 September 2017. As a result of the earthquake, "the pyramid suffered considerable rearrangement of the core of its structure," said archaeologist Barbara Koniecza of the National Institute of Anthropology and History. The greatest damage was at the top, where two temples had already been discovered - one dedicated to the Mesoamerican god of the sun and war, Huitzilopochtli, and another to Tlaloc. "The floor of both shrines sank and bent, which also put their stability in danger," Ms Koniecza said. When the institute carried out studies with radar to examine the pyramid's structure, they found traces of the newly discovered Tlaloc temple. In Ireland, the discovery of a possible archaeological feature near the UNESCO World Heritage Site close to Newgrange in Co Meath has been described as "a very significant find" by the Department of Culture, Heritage and the Gaeltacht. The recent heatwave has been described as vital in the discovery of a possible henge, or circular enclosure, which may be of archaeological interest at the Brú na Bóinne site.